Not much to do with transportation, but according to wikipedia Nick Clegg, who is the leader of Britain’s Liberal Democrats, and doing surprisingly well in the lead up to their Parliamentary Elections, spent a year at the University of Minnesota. If Tim Pawlenty were to get the Republican nomination and be elected, it would be possible that both the PM of the UK and the President of the US were both U of M alums. How often have leaders of both countries attended the same schools (e.g. Clinton and Blair both went to Oxford)? Like the Vikings and the Superbowl, Minnesota is doomed to bridesmaidery in national elections. Consider Presidents Harold Stassen, Hubert Humphrey, and Walter Mondale. Anyway, for the record, I’m with Nick. This set of blog posts reviewed the state of HSR planning in the United States c. 2010. The plans generally call for a set of barely inter-connected hub-and-spoke networks. There is sometimes a danger of a planner falling in love with his map. There is no danger here, even the same agencies have random maps. It seems as no one cares where the lines actually go, so long as they are high-speed rail. The marketers have also made a mistake, 220 miles per hour sounds a lot slower (and less futuristic) than 350 kilometers per hour. The US carries a greater share of freight by rail than Europe. Converting rights-of-way into passenger only (which is required for HSR) may cost some of that freight share. Any money spent on HSR cannot be spent on something else. The issue of opportunity costs is seldom metnioned. The evidence from US transit systems shows that lines have two major land use impacts. There are positive accessibility benefits near stations, but there are negative nuisance effects along the lines themselves. High speed lines are unlikely to have local accessibility benefits separate from connecting local transit lines because there is little advantage for most people or businesses to locate near a line used infrequently (unlike public transit). However they may have more widespread metropolitan level effects. They will retain, and perhaps worse, have much higher, nuisance effects. A previous study of the full costs of high-speed rail in California (Levinson et al. 1997) showed that the noise and vibration costs along the line would be quite significant. Some examples are reported here, typical lines may have noise damage costs on the order of $1 billion. If high-speed real lines can create larger effective regions, that might affect the distribution of who wins and loses from such infrastructure. The magnitude of agglomeration economies is uncertain (and certainly location-specific), but I think presents the best case that can be made in favor of HSR in the US. That said, remember that real HSR (not the short term improvements to get to 90 or 110 MPH, which may or may not be a good thing, but are certainly not HSR) is a long term deployment, so it needs to be compared with cars 10 or 20 or 30 years hence, and the air transportation system over the same period. Cars are getting better from both an environmental perspective and from the perspective of automation technologies. The DARPA Urban Challenge vehicles need to be bested to justify HSR. Cars driven by computers, which while sounding far off is technologically quite near, should be able to attain relatively high speeds (though certainly not HSR speeds in mixed traffic). Further they may move less material per passenger than HSR (trains are heavy), and so may net less environmental impact if electrically powered. Aviation is improving as well, both in terms of its environmental impacts and its efficiency. Socially-constructed problems like aviation security or congestion can be solved for far less money than is required for any one high-speed rail line. The local land use effects of HSR are likely to be small to non-existent. The agglomeration benefits may exist, but there is little grounds for concluding their size. All opinions and errors are those of the author. 6New York (1), Los Angeles (2), Chicago (3), Dallas (4), Atlanta (9), Phoenix (12), Denver (21), and Orlando (27) http://en.wikipedia.org/wiki/Table_of_United_States_Metropolitan_Statistical_Areas . 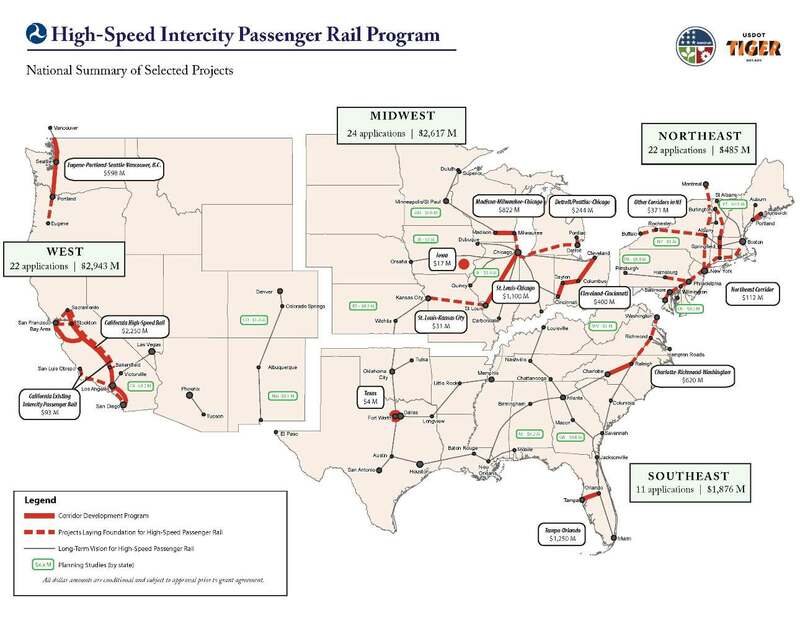 7Alaska, Hawaii, Idaho, Utah, Wyoming, North Dakota, and South Dakota are excluded from the Intercity Passenger Rail Program. However North Dakota and South Dakota have been included in the Minnesota State plan (connecting to Sioux Falls and Fargo). 18California High-speed rail Authority, “Nearly 160,000 Construction-Related Jobs, 450,000 Permanent Jobs,” http://www.cahighspeedrail.ca.gov/news/JOBS_lr.pdf. 19CRS Report R40104, Economic Stimulus: Issues and Policies, by Jane G. Gravelle, Thomas L. Hungerford, and Marc Labonte. 20U.S. Government Accountability Office, High Speed Passenger Rail, GAO-09-317, March 2009, Washington, DC, p. 29, http://www.gao.gov/new.items/d09317.pdf. 21Eddington Transport Study, 2006, p. 208. On 22 Apr 2010, 09:22.